PA pieces destroyed at zero health. Fusion cores no longer rain from the sky... or always have 100% charge. Oh, and crafting station requirements that actually make sense, for the solo scrounger on the go. Identical to 1.2.3 - some folks are getting the old version. If you have no issues with 1.2.3, no need to change. This is literally just a version number increment. 1.2.1 (now removed) would set off the warning alarm on nearly every hit to the player, even after you left your armor. Oops. Fixed: Terrible, terrible bug where unequipping a perfectly good PA piece, while still in the PA frame, would delete the piece forever. Gah. Broke out a second version without the leveled-list changes to loot, containers, NPCs, etc. FOMOD contains both original and PA-only versions. When a Power Armor piece is destroyed, it's really destroyed. No silly zero-weight, zero-health inventory entry, with the broken pieces of it on the ground. Maybe now there can be some meaning and purpose to the ten jillion PA suits around the Commonwealth. So why use it now? 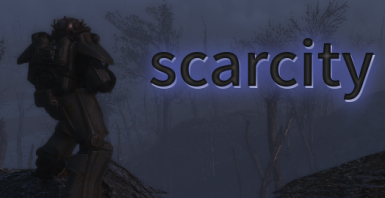 Scarcity's Power Armor is much more protective than Vanilla PA, preventing more damage from reaching the player, and grants immunity to poison and acid, when in good condition. But as its condition degrades, so does its protection. A completely banged-up suit of Scarcity armor will protect you less than Vanilla PA.
And it will cost you more to repair. You can no longer fix the most advanced infantry weapon ever created by slapping 4 tin cans together. Instead of "4 steel," repair requirements have been made meaningful, using better components. Power Armor will protect you well - as long as you maintain it well. And maintaining it will no longer be trivial. Doesn't touch general loot rules. Compatible with loot-changing mods and overhauls. Random Fusion Core changes are kept. Full version with extensive changes to leveled lists, requiring higher levels for better loot. The PA-Only version's Fusion Core changes edits a single record of "what kind of FC just dropped?" and is therefore safe with any other Loot mod - FROST, Horizon, whathaveyou. Put the PA version after any overhaul; it only modifies Vanilla Power Armor and the Fusion Core drops, so putting it second ensures the FC change carries over. Horizon has its own version of the random charge effect; but you'll need mine second to get PA changes. Let me know if Horizon's function is vastly different. Technical note: it doesn't touch anything that calls for an FC drop. No containers, NPC lists, etc. Only the single form that determines what you get when you win a Fusion Core. So, if your overhaul makes FCs extremely rare - then not only will they be extremely rare, but they'll drop with a random charge. Significant changes to item drop rates and level thresholds. As with the PA-Only version, Fusion Cores are far more rare, and when they are found, they probably won't be at 100%. A variety of charge levels will be found, from nearly-depleted on up. Stimpacks, bobby pins, purified water, and antibiotics are less likely to be found in containers. Weapon tech levels are greatly spaced out. You will need to be higher level before seeing the better weapons. Your fully-modded pipe gun will be your best friend for a while. Finally finding a new weapon will feel like the major boost in power that it should. Crafting station requirements have been altered to make some damn sense. Supply lines and stores and things still require Local Leader, because those ARE about managing people. NOTE: An upcoming update will also allow Science 1 to build the Weapons bench, as someone pointed out Energy weapons to me. The full version alters the jumping begeezus out of leveled lists. There's just no other way to do it. The drop rates and pretty much everything tied to "crap you find" are all in the base leveled-list forms. If you use any mod that *adds* things to the leveled lists via script, you're fine. Just make sure they come after Scarcity. Anything else that also alters leveled lists for weapons, ammo, loot in boxes, etc., will conflict. There is a PA-Only version in the installer that does not have all the list changes, which should make it compatible with all the various loot overhauls and total (non-PA) conversions. The Piezoelectric, the Tesla pieces from Automatron - they're left alone. They won't get destroyed; they will still become the silly 0-health phantom item in your inventory. As there's no way you could get them back outside of console commands, the mod is being released in safe-mode. If any masochists out there want a patch that will let the unique or named pieces get wrecked too, let me know. I recommend using this on a new playthrough, to get the full effect of the changes to loot and weapon upgrades. For an existing game: if you are wearing PA in your savegame, EXIT YOUR ARMOR, make a new save, and THEN activate this mod. The scripts don't seem to get applied correctly to existing pieces that are actively equipped.